The Moores Bridges Water Treatment Plant in Norfolk, VA had a pump problem. The pumps were used for metering sodium hypochlorite (NaOCI) for the treatment of 72 million gallons of water every day. Any downtime or unexpected repairs meant long nights for the professionals who ensured clean water was delivered to the more than 850,000 people served by the water plant. Unfortunately, breakdowns were a frequent occurrence at the water plant. By 2009, 10 of the original 15 hydraulic metering pumps were permanently out of commission and another 1-2 were constantly in and out of the repair shop. Frequent, complicated and labor intensive repairs consumed up to 30 hours of production time every week. 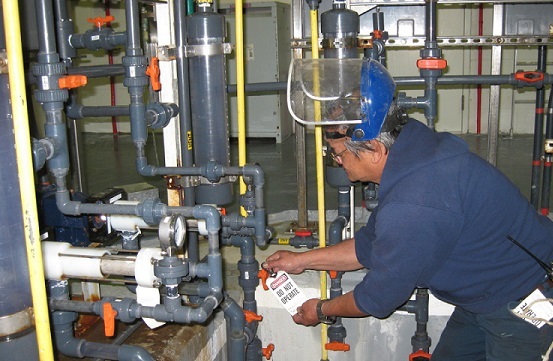 Diaphragm pumps are inherently complex and prone to maintenance issues. The original pumps required pulsation dampeners than shook the pipes, causing leaks and vapor lock as well as structural damage. Repairs were not only time-consuming, but costly; the pumps’ repair kits cost $2,200 to $2,500 each. With the rate of pump failure so high, the plant was spending nearly $5,000 each year on repairs alone. Billy Branch, maintenance supervisor of the water treatment plant, knew there had to be a better pump option. And he was right. After unsuccessfully testing a hose pump, Branch signed up for a free trial of seepex Progressive Cavity pumps through a local distributor. The trial was an undisputed success. During the trial, plant operators manually adjusted the feed rate by tracking chlorine levels. The pumps were protected from run-dry and over pressure, pumping against high pressure without pulsation or lock. Satisfied with their performance, Branch ordered all-new seepex MD series PC pumps to replace the hydraulic diaphragm metering pumps after the trial period ended. This action was just in time; as Branch ordered the new pumps, the old diaphragm metering pumps suffered one final failure. "I told Stuart our situation and he immediately returned the trial pump," says Branch. The progressive cavity pump has a functional flow rate of .05 to 2 gpm, speed range of 36 to 284 rpm, can handle pressure to 80 psi, and feature ½ HP geared motors. The materials of construction were important for this particular application, as NaOCI has corrosive properties. To protect against this chemical, the suction and pressure branch were made of High-density Polyethylene (HDPE), while the stator and rotor material were similarly selected; these were made of ethylene propylene diene monomer (EPDM) and Titanium, respectively. Above all, progressive cavity pumps offer users an excellent lifecycle cost due to their long life and reliability, meaning that downtime and costly maintenance is kept to a minimum. For Moores Bridges, this meant saving up to $5,000 every year in repairs alone. Progressive cavity pumps also will not vapor lock and are protected from both dry run and overpressure. Following the installation of seepex Progressive Cavity Pumps for NaOCI pumping at the Moores Bridges Water Treatment Plant, Branch explored other potential uses. The plant’s aqueous ammonia dosing pumps were in need of replacement due to inaccurate dosing from lost prime. After integrating two different sizes of seepex MD range metering pumps into their SCADA system for testing, Branch replaced all 8 original ammonia pumps with seepex progressive cavity models. Now three year later, the facility has saved $15,000 in maintenance. "We went from spending more than $2,000 on each repair kit to spending $5 on a quart of 220 oil," says Branch. seepex manufactures German-engineered Progressive Cavity pumps, macerators, control systems and accessories from its facility in Enon, OH, USA. The company’s state-of-the-art quality management system consists of 8 groups and 27 ranges, providing solutions in nearly any process. Learn more about progressive cavity pumps and their applications and read the full case study at seepex.com.